Posted by santos. This entry was posted on 20050522 at 4:30 PM You can skip to the end and leave a response. As a caffeine addict, this looks jitteringly good! Unfortunately we're heading into winter down here, but I'll have to remember this one for when summer rolls around. Santos - this looks wonderful! I've never had coffee gelatin, but it sounds good - especially with the cardamom! 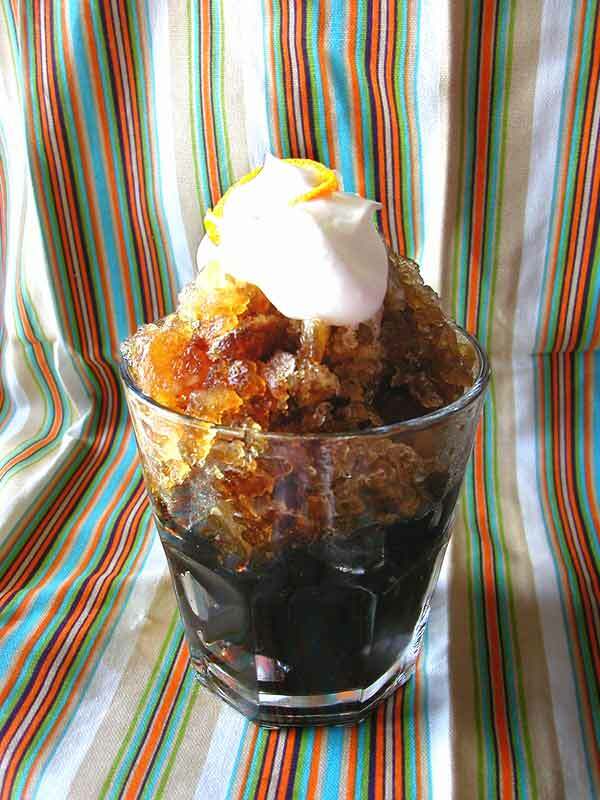 As for the coffee granita and whipped cream on top...mmmm! hi ag--oops, i forgot you're heading towards autumn. this is definitely worth saving; i managed to make it last for most of the afternoon, and it kept me cool *and* awake. hi cathy! i wasn't going to add cardamom, but i had the bottle out from my little icelandic pancake escapade. it worked out quite well, though. did you have any granita when you were in palermo? It's amazing how you come up with these now-why-didn't-I-think-of-that recipes. I'd never have thought of making granita using coffee, but now it makes perfect sense. This looks great! Perfect for hot summer days. Love the coffee granita match with the jelly. One for me to try in summer. zippity do dah...this would be a lovely mid-afternoon pick me up! Santos, this sounds right up my alley...I'm definitely making it this summer- thanks a mil! hi everyone! this is definitely something worth trying during the summer to beat the heat. the granita takes a little longer to melt than something of a finer texture, and the jelly is something cool to chew on once it does melt. reid--uh oh, what did you do? did the ono kine yakuza force spiceblog to ditch his post? it's not there! It's there now, he just completed the write up. Much more exciting than mine. He took the long way too. Not in Palermo, but in Lingua (lemon) and in Taormina. In Taormina I had some almond granita with whipped cream on brioche - heaven! hey reid--exciting but perilous. i'd much rather try your recipe. but your photo's just as great. hey cathy--oh. my. flippin'. pancakes. i have to try that, it sounds AMAZING. Did you know that you can buy Plymouth Rock brand coffee gelatin powder on line? Old New England favorite, available from several sources. Very good with whipped cream. WHERE can I buy Plymoth Rock Coffee Gelatin Powder? ?